Postdoctoral researcher Josh Vandenbrink and Dr. Kiss (l-r) load samples onto a clinostat, a device that simulates microgravity and helps them analyze results from spaceflight experiments. “My life is sort of the space era,” says Kiss, a professor of biology and dean of the UNC Greensboro College of Arts and Sciences. But there’s no way he could have known in 1969 that he would one day do research that could help humans take longer space flights and live on the moon or Mars. Kiss is not a rocket scientist. But he’s one of a small cadre of space biologists, scientists who study how living systems function beyond the Earth’s atmosphere. Kiss has devoted more than 25 years to understanding what happens to plants in space. It’s critical work because, as NASA and other space agencies around the world plan for potential bases on the moon, interplanetary flights and putting humans on Mars, plants will be essential. In the sealed environment of a spacecraft, space station or extraterrestrial base, plants could help turn carbon dioxide exhaled by astronauts back into oxygen they can breathe in again. They could also produce food – essential when the nearest grocery store is back on Earth, hundreds of thousands or millions of miles away. Want to learn more about Kiss’ research? 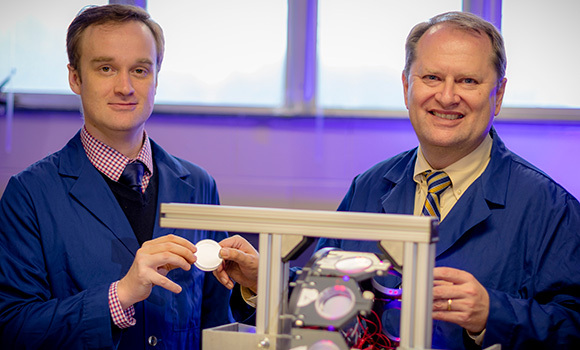 Click here to see additional images and read the full story as it appeared in the spring issue of UNCG Research Magazine.